Massey University director Māori Associate Professor Te Kani Kingi says six years on it is even more important for the awards to be held given the recent announcement about the future of the New Zealand Book Awards being under threat. This year 16 books are finalists in the arts, biography and history, fiction, non-fiction, and te reo Māori categories. “It is heartening to see such a strong line-up of finalists and also a growth in the number of publishers,” Dr Kingi says. 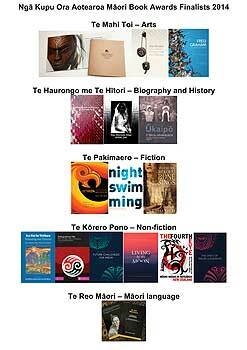 The shortlisted books are on Māori topics published between July 2013 and March 2014. Dr Kingi says the four-member judging panel has been impressed both with the number of books published and in the quality and scope of them. The panel is headed by Te-Pūtahi-a-Toi (School of Māori Art, Knowledge and Education) senior lecturer Dr Spencer Lilley and includes kaihautū Māori (Māori library services manager) Sheeanda Field, Te-Pūtahi-a-Toi lecturer Dr Darryn Joseph and an external judge, Alexander Turnbull Library chief librarian Chris Szekely. The winners of each category will be announced at a book awards celebration event to be held at Te Papa in Wellington on December 10. Two books by Massey staff feature in the non-fiction category shortlist in this year’s Ngā Kupu Ora Awards. He Kōrero Anamata: Future Challenges for Māori edited by Massey Assistant Vice-Chancellor Māori and Pasifika Dr Selwyn Katene and Massey Research Development Adviser Malcolm Mulholland. The spirit of Māori Leadership another book by Dr Katene is also a finalist. Two books by Massey graduates also feature as finalists. Phil Belcher has been selected as a finalist in the arts category and Tina Dahlberg has been selected as a finalist in the fiction category. Publishers in the finalists list this year are Aka & Associates, Anahera Press (two books), Common Ground Publishing, Fitzbeck Publishing, Hastings City Art Gallery, Huia Publishers (three books), MTG Hawkes Bay, Pearson, Pihopa Kingi, University of Minnesota, University of Otago Press and Vintage.